Yesterday was a soap day for me. I had a few ideas going through my head and some new scents I wanted to try out. I decided to make 3 batches. 1 batch was a 2 lbs loaf with a blend of Capri Olive and Basil, Sage, and Mint. I added tomato powder to this one as well as some soap balls I made from some of the extras of an older batch. 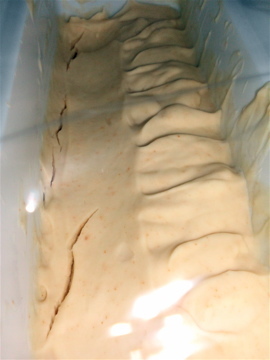 So far it’s still too soft in the mold to try and get out so I have it sitting on the curing rack for a few days and then we will try again. 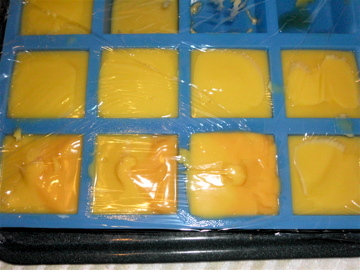 This batch had lard, coconut oil, olive oil, and castor oil. I am finding more and more that I really like lard soap. I cannot wait to cut this batch and see how it looks. For some reason it turned out much lighter than my other batches (I only had dk olive oil on hand). I still have some oils left and lard so I am thinking I might be able to get one more 2 lbs batch in possibly tonight maybe tomorrow. I have this Carrot Cupcake FO from Nature’s Garden that I want to try out. It was one of my best sellers in my MP soaps and I would love to see how it behaves in CP. I also tried to get some more stuff together for a small little craft show I am doing on Saturday at the local elementary school. So what have you all been up to this past weekend? What a great way to spend your Sunday! I’m excited to see your first batch cut, I’m a fan of embedded soap balls, they’re so fun!